Plan for where puppy is going to potty with an eye on where you want your fully grown adult dog to go to relieve themselves. Plan for where the puppy is going to sleep and who is going to get up to take her out to go potty. Plan feeding locations and schedules and who is going to feed. 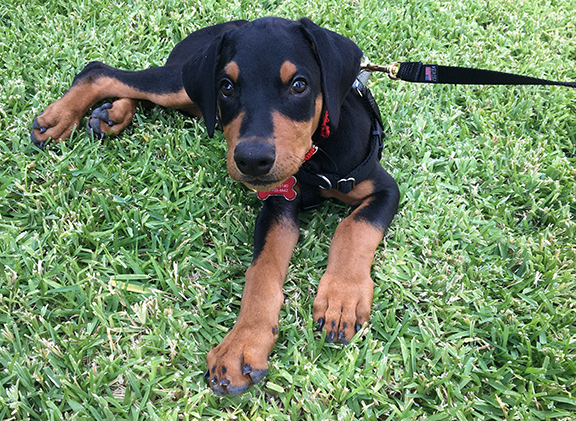 Plan a fully fledged socialization schedule in advance, with a checklist of things your puppy has been introduced to and note any fear reactions. Introduce your new puppy to their new life. Whether you’re planning on going hiking or camping or just hanging out at home, you need to introduce your puppy to the sights, sounds, smells, and surfaces of their new life. Introduce things slowly one at a time, and make sure your puppy is not acting fearful. If your puppy displays fear, you may need professional training help. Fear can be freezing in place, growling, cowering, running away, trying to climb you to get away, or any escape behavior. Agree on house rules in advance. Getting everyone to agree on house rules will save your new puppy years of confusion. Is your puppy allowed on furniture? Allowed in the kitchen or dining room when there is food present? Is your puppy allowed to jump on people? Lick faces? Sit down and have a family meeting so everyone knows the rules. If you need help setting up a system and rules, call us! We’ll use the 1 hour consultation to help you determine the best potty, sleeping, and eating spots. We’ll help you set up the potty, eating, sleeping, and socialization schedules. Have questions? Get them out ahead of time!